Hollywoods seems to be developing a bit of a tendency to reboot film series by just remaking one of the earlier movies. These new motion pictures do not tell exactly the same stories as before but there are several key events and story beats that are blatantly repeated. It is not a brand new idea to not have any brand new ideas, Star Trek Into Darkness did it back in 2013, but with Jurassic World, Star Wars VII and now Creed it seems to be becoming a proper trend. In fact this new Rocky film might actually be the worst offender. 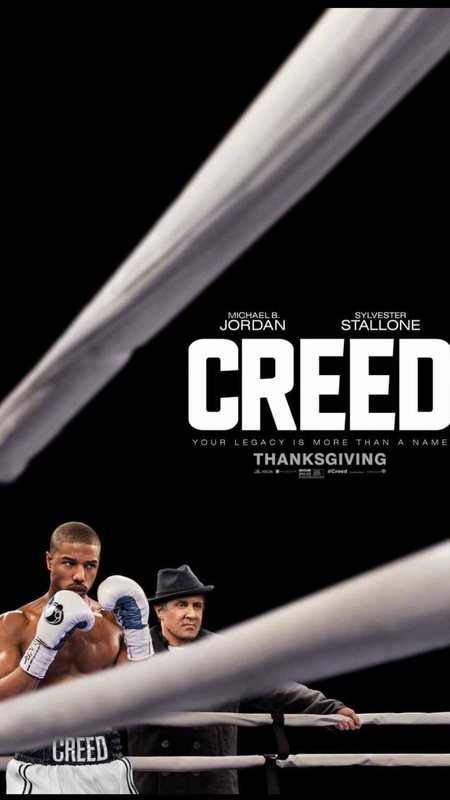 Creed tells the story of how Sylvester Stallone’s Rocky Balboa finds a new love of the fight by training the son of his greatest opponent/friend Apollo Creed and it very closely mirrors the older boxer’s initial rise to fame, recognition and success. Sports movies are cliched at the best of times but this one is predictable to the point of parody. I won’t go through all of the repeated elements as some may count as spoilers but you will have worked them all out for yourself within the first 30 mins, even if you’ve not seen any of the previous films. Plot points aside, it has the same bombastic score (don’t get me wrong, I loved Bill Conti’s music for the other movies), the same plot contrivances to get a rookie in the ring with a champion and the same habit of demonising the other fighter. In this film in particular the efforts to make the other guy objectionable just seem like lazy, one dimensional characterisation (despite a rushed attempt to address this in the closing minutes). Just because you want to punch the guy, it isn’t enough reason to get the hero in their punching the guy. Then the final fight begins (sorry if that was a spoiler) and for ten minutes you forget everything. No matter what has gone down before this point once the smack down starts you are invested in the film 100%. It may be a retread but it is still hard not to get swept up in it all. Creed is not a bad film. The performances are universally good, especially Stallone who is as comfortable in Rocky’s skin as he is in his own, and the story is engaging. It just doesn’t do anything new. If this is a Rocky film for a new generation then it is probably exactly what it needs to be but as a sequel it does all seem very familiar. There are moments of excellence, the first proper fight is shot expertly in what seems like one single shot, but it’s not a knock out. The film is a 12A but that doesn’t present any compromise in the authenticity of the fight scenes; the original movie was a PG. Blood is spat out and bruised eyes do close up but none of it is too disturbing. The two main female characters, the only two women really, are the mother and the girlfriend so there is no challenge to convention their either. Now, if Apollo Creed had had a daughter, that would have been good, still not totally original but it’s a start. The Revenant, redefining cinematic experience and the Rebecca Principle.